If you are traveling to Phoenix, AZ with your family, there are two places you should not miss, The Musical Instrument Museum and Organ Stop Pizza. The Musical Instrument Museum is approx 3 years old and may be the best museum in the Phoenix area. On display are over 12,000 musical instruments from around the world. The best way to describe it, is a cultural snapshot of the world as told through the native musical instruments of their country. For example, when you stand at the Fiji exhibit you see the musical instruments that are native to the country. With the headset that is provided to every guest you also watch an HD video of natives playing their instruments in their home country. It is a fascinating museum to visit. In addition to the various countries, there is an artist gallery with things like John Denver’s first guitar and the piano on which John Lennon composed the song “Imagine.” They also have a wonderful 300 seat concert hall presenting a broad range of concert programs. Visit www.themim.org to see the schedule. The Musical Instrument Museum is located at the corner of Mayo Blvd and Tatum in north Scottsdale. 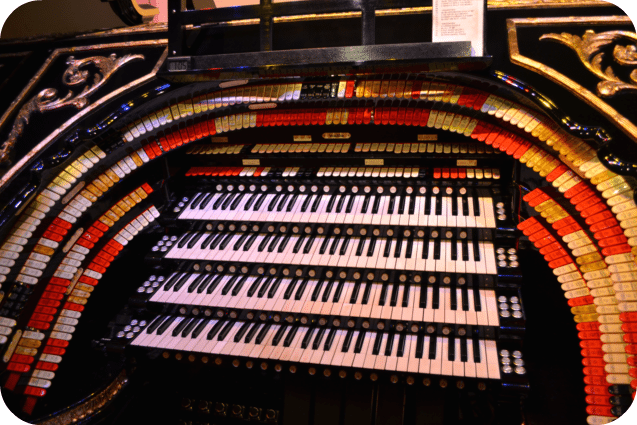 If that isn’t enough music, then drive to Mesa and have dinner at Organ Stop Pizza, home of the Mighty Wurlitzer Organ. In the late 1920‘s and early ‘30s pipe organs were used in many theaters across the U.S. to accompany silent films. As talking motion pictures came on the scene, these organs were slowly silenced. In the early 70’s Organ Stop Pizza bought this Wurlitzer Organ from the Denver Theater and refurbished and expanded it to its current glory. It is now the worlds largest Pipe Organ. So massive, in fact, that the building for Organ Stop Pizza had to be built around the organ. The organ is presented to the 700 seat pizza parlor on a hydraulic rotating elevator, that rises from below as the organists begin their shows. They play mostly requests and you can hear every kind of music imaginable. Yesterday, when we arrived, almost half the audience was standing, It took a minute to realize the organist was playing the Canadian National Anthem. He followed that with the Star Spangled Banner and, you guessed it, the other half of the audience rose to their feet. Oh and by the way, they serve pizza. Organ Stop is located at 1149 E. Southern Ave at the corner of Southern and Stapley. Their hours vary with the season but basically 4 pm-9 pm weekdays and till 10:00 pm on weekends. Come early. It’s almost always crowded.